Survelliance video released by the NYPD shows two suspects in the shooting death of a 15-year-old Brooklyn boy. 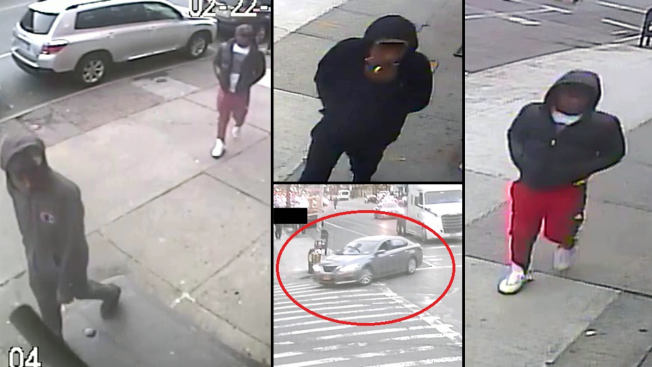 Police released photos and video of suspects in the deadly shooting of a Brooklyn teen who his family says was on his way to the grocery store when he was gunned down. Samuel Joseph, 15, was shot in the head and torso in front of his apartment building on Flatbush Avenue just before 6 p.m. Friday, police said. Family members and friends could be seen comforting one another on the street outside the building on Flatbush Avenue, where a candlelight memorial was growing. He was described as an "inspiration" to his neighbors and a regular at the YMCA where he played basketball with other kids, said Assemblymember Rodneyse Bichotte, who represents the Little Haiti neighborhood. No one has been arrested. Police said two men between the ages of 18 and 25 were caught on surveillance photos and video. One of them was wearing red Adidas sweatpants with white stripes. Police released these surveillance images of two suspects in the shooting death of Samuel Joseph, 15. They were believed to have arrived and fled in a car, police said. "There's nothing to say," Don Joseph said, "We just hope justice will come."